Why is .Net Core One of the Best Offerings from Microsoft Today? This is a sure shot delight for all â€“ especially Microsoft lovers. This technology giant has been known for its own proprietary frameworks and solutions. For the very first time, Microsoft has come up with a trending open source technology â€“ Announcing .Net Core, which has been looked up as one of the biggest transformation of .Net since its beginning and will surely redefine it for years to come. Considered to be a subset of the .Net framework, it is built with the similar code base, is cross platform and freely available on Github. With the synergetic contribution from thousands of developers from diverse organizations, this novel technology also imbibes the release of the .Net Standard Library, making it simplistic for developers to operate on various operating systems like Linux, OS X etc. and reusing the code across various types of devices. Microsoft is also working towards making .Net Core obtainable on Ubuntu, Debian and CentOS. It possesses simplistic features like reusability of code for apps that execute on servers, cloud and on any type of device including Windows, iOS and Android. Retaining the core values of the original .Net as based on Enterprise class development, .Net Core encompasses a higher performance module design which is easily adjustable to newer versions without any adverse effects. ASP .Net Core 1.0 is framed on the top of .Net Core. It is also developed in collaboration with multiple developers and adds a feather to the cap of the .Net family, with its alluring and technically superior features. .Net Core talks about dual components â€“ a small runtime framed on the similar codebase as the .Net framework CLR and the base class libraries. The runtime is delivered on NuGet, through the Microsoft CoreCLR package and the libraries are almost the same as the .Net ones but have been changed based on the set of libraries available. Why is .Net Core Considered the Upcoming Technology of Today? 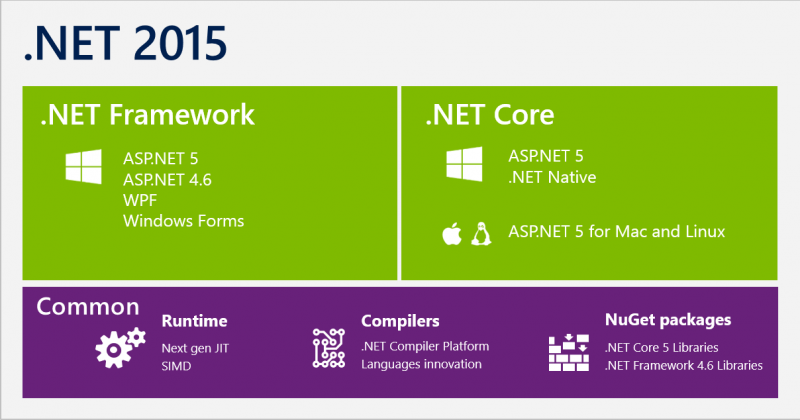 .Net Core has been focussed upon today, in the IT scenario as the â€˜INâ€™ thing. The prime reason why it is looked upon is that it is shipped by NuGet which lets you avail a private version for your specialized app and facilitates privacy in your appâ€™s behaviour, which cannot be changed by others. Also, apps can be built using the free Visual Studio Community Edition, which also specifies features of VS Pro, which surely is a delight to use. Also, the developers will have a family of builds already ready for use and that definitely helps the developers fasten their job to the maximum. It surely offers a very bright and happening development environment. Because it is portable across platforms, there is a lot of reusability of code and all types of prime functionalities can be implemented with ease. Key tasks like local file read through etc. now will be shared within the same infrastructure. With the help of 3rd party infrastructure like Xamarin, the entire framework can be portable to iOS and Android too. Its modular setup and release through NuGet in small packages enables higher agility development framework and gives an open option to developers to choose and implement needed packages as and when available, for your apps and libraries. It gives the garbage collector, type system, assembly loading, resident interoperability and other required infrastructure. It is built on the same codebase as the .Net framework CLR and includes the same GC and JIT. It excludes features like Application Domains or Code Access Security and is delivered on NuGet. It provides primordial data types, fundamental utilities and app composition types. Almost similar to those available in the original .Net Framework these libraries have been built to fit in smaller group of libraries and do not have dependencies fitted in. It selects the runtime and hosts the runtime, giving an assembly loading policy and launches the app. This host is also available to commence SDK tools in a similar manner. Dotnet Core SDK facilitates the ground developer proficiency which is right there in the .Net Core SDK. ASP .Net Core apps can execute on .Net Core framework and has been framed to give a comprehensive development framework for apps to be implemented on different infrastructure. With various modular components under its sway, it preserves its suppleness when the solution is being built. It is a refurbished framework focussing more towards cloud computing and module web apps, with a new tint of features to make the entire package an exciting one. This novel technology has been carved with an inherent support to diverse platforms including Windows, Mac and Linux and there are plans to incorporate more. As in .Net framework, here, it is not essential to execute it on the IIS web server. It can easily work on the non IIS web servers. Both the major frameworks â€“ System.Web.Mvc.Controller base class and Web API 2 controllers are merged into a single unit and hence can easily be configured and implemented. With this unification, there are many other parameters like Http verb mapping that can also be established, making it a better infrastructure. The new framework of ASP .Net Core proposes 4 different models like Singleton, Scoped, Transient and Instance, which support all the different kinds of environments any kind of app development project can encounter. In this new MVC, it is very much possible to use partial views to reutilize markup and code. There are â€˜View Componentsâ€™ which can, based on its classes, let you disconnect the code and markup from each other and with the use of simple commands, can act as a perfect solution. In order to maintain and manage the project level configuration information, ASP .Net Core 1.0 uses a specific file â€“ Project.json which stores the configuration data in the JSON format and can store multiple settings at one go in the project framework. It is a sure thing that looking at the bright offerings from Microsoft, you would want to plunge in the .Net Core framework and experience the key benefits and offerings. So why wait! Get started right away. This entry was posted in .Net Development and tagged .Net Core, Microsoft open source, Web App development. Bookmark the permalink. ← Get Ready to Experience Android N â€“ A Sure Shot Delight!